And who’s the featured macher??? 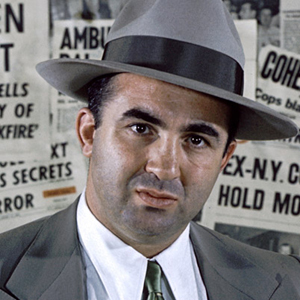 MICKEY COHEN!!! Historically speaking, they’re chowing down with the LA mob boss at EATER LA. Since he really understood L.A. real estate, particularly when it came to the lines between the city and county (and, yes, HE DID KNOW HIS MODEST BRENTWOOD HOUSE , which sold in 2011 for $3mil+, WAS IN CITY TERRITORY — the LAPD was juiced, too, you know), you can see more whale action at CURBED L.A. Note: Mickey Cohen’s original bookie joint was in the Stratford Coffee shop, which does still exist intact, signage and all, on South Rampart Blvd., near the building they show at Curbed L.A. It’s on the east side of the street, look for the sign on a 1920’s brown-brick, multi-story strip mall. HAVE A WHALE OF A WEEK! By convicting Conrad Murray, MD., I’m convinced the jury reached a just verdict in the Michael Jackson manslaughter case. Malfeasance, mistakes, or plain ineptitude by callous medical professionals resulting in deaths — and that includes “care” by MDs, down the chain to those barely licensed — is extremely common and usually motivated by incompetence and/or greed. Unfortunately, these cases are rarely prosecuted (laws protect medical practitioners, they protect each other, and, in this case, the events occurred in an isolated home environment with no oversight). Michael Jackson’s family and the LA County DA should receive kudos for the vigilante pursuit of this corrupt, reckless physician. The great tragedy is that Michael Jackson is dead – Dr. Murray may have been in a conspiracy with his meal-ticket, mega-star patient – but he is alive; a culpable co-conspirator who was heavily remunerated.It’s frustrating but because of over-crowding in the state prison system, due to lack of funding, early releases for non-violent offenders like Murray are the norm. He will probably receive a very short prison stay, probation, possibly home monitoring, and hopefully the loss of his medical license.